The Fireplace in Brookline is the kind of place that lists “Grilled Steak with Blue Cheese Butter” under its “Lighter Fare” options. And even though that’s a gross misuse of the term “light,” I think it’s ok. The truth is, there is no such thing as light fare- or even lighter fare- at The Fireplace. It’s pretty much Thanksgiving dinner, every night of the week. If, along with rich food, your Thanksgiving usually includes a pleasantly staffed, warmly spirited restaurant with twinkle lights, an open kitchen, and a brief but well thought out wine list. The menu starts with a long list of appetizers (twin lobster rolls, anyone? ), includes a salad section (you can add an assortment of meat to any, but most – like the Baby Arugula with Crispy Duck- already include protein), and ends with an extensive entrée list -try the lobster mac and cheese, pork chops, short ribs, burgers, or just some risotto. Carrot and Fresh Thyme Carnaroli Risotto with Honey and Cider Braised Red Cabbage, Toasted Almonds, and Rhode Island Feta, to be precise. Or, you can always opt for the specials. 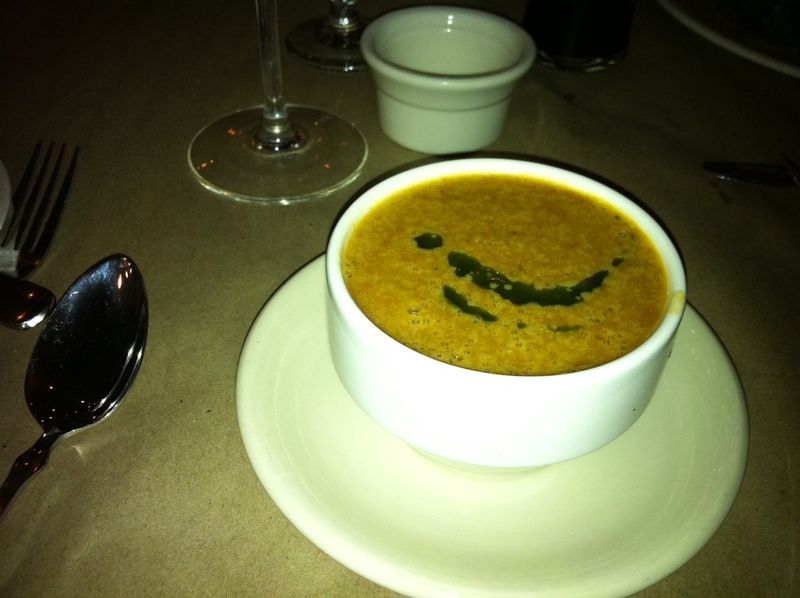 Last night we tried the Lobster Bisque – a rich, stock-y execution drizzled with oil. It was smooth in texture, and there were no actual pieces of lobster. This was compensated for by the broth itself however, which had a deep lobster flavor without any hint of fishiness. Still, I could have gone for a little piece of lobster tail on top. Just sayin’. We also had the Butternut Squash, Braised Leeks and Heirloom Radish Tart with Consider Bardwell Cheese, Toasted Walnuts and Bourbon-Maple Glaze. The sweetness of the squash was tempered by the cheese, and the crust of the tart- which can really make or break these things- was crispy without being dry. The Fireplace pretty much had me at “pork belly” when I saw the entrée list, and my Pan Seared Scallops and Confit Pork Belly with Roasted Turnips, Parsnips, Rutabaga and Carrots lived up to its sumptuous name. 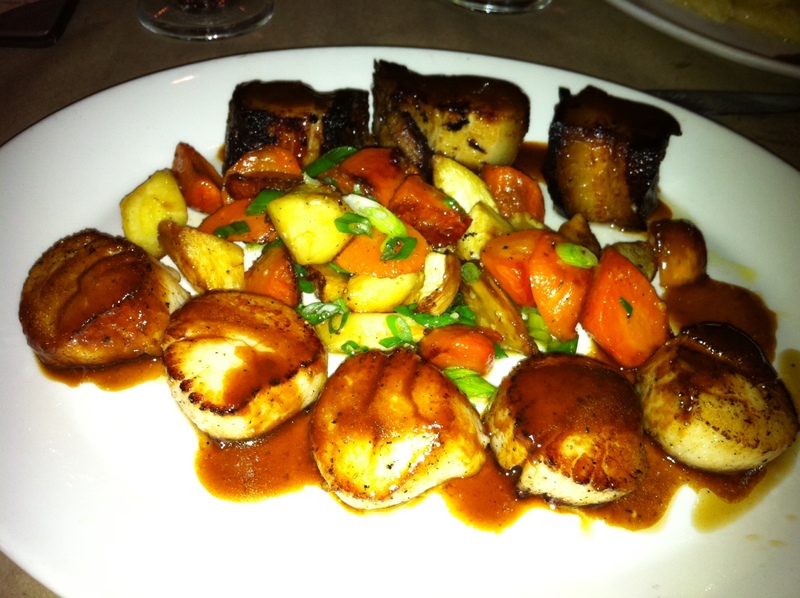 The pork belly was good, if not particularly exceptional, and the scallops were cooked perfectly. The stars of the dish, however, were the vegetables. Even though it’s almost spring, this grouping of fall roots – perfectly roasted and then seemingly rolled in just the right amount of butter (or some other delicious fat)- made me want to curl up with a big blanket and hibernate. The Braised Beef Short Ribs with Cheesy Cornmeal Porridge, Baby Carrots and Garlicky Broccoli weren’t too shabby either. The porridge was a little different from the traditional short rib side – polenta – and a little smoother in texture than just straight grits. 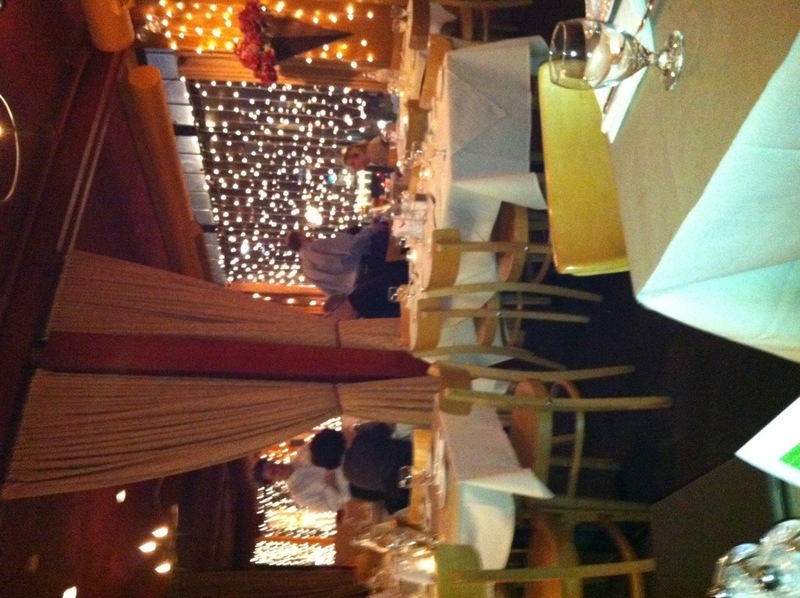 I wonder how many people make it to dessert at The Fireplace. They have plenty of options, but after all of that rich food, how much room do you really have? Though, if we’re likening this to Thanksgiving, let’s be honest- everyone always makes room for dessert after turkey. And yes, I certainly pushed a few things around to give space to the Apple Doughnuts after my dinner last night. 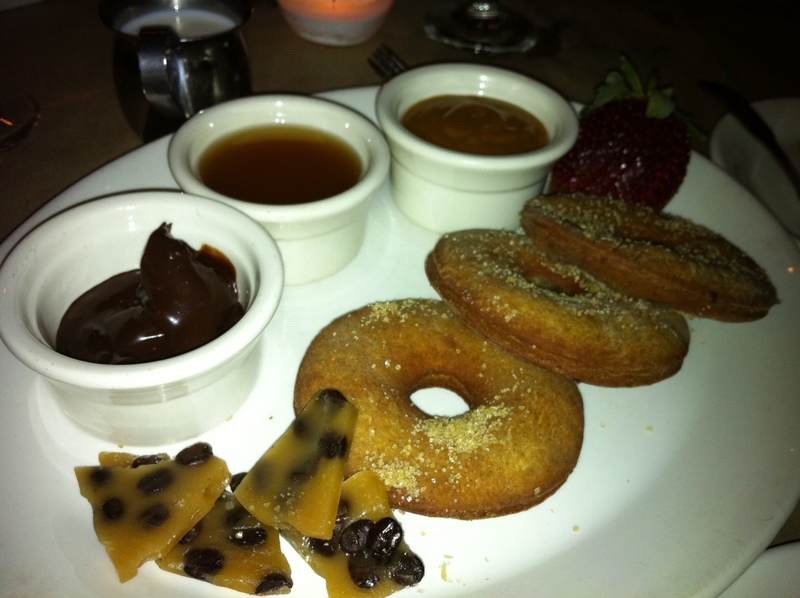 The doughnuts came with three dipping sauces – chocolate, coffee cream, and sticky cider, and while I could have (and almost did) finished off all of the dipping sauces with just my spoon, the doughnuts weren’t the highlight of the evening. The flavor was nice, but the texture was a little too hard for my taste. When you hear the word “apple doughnut” in New England you think of a fluffier, cakier version of a doughnut then what was served. Next time we’ll try the Taza Chocolate Fudge Cake with Vanilla Bean Ice Cream and Port Cherry Sauce. I’m a sucker for Port Cherry sauce. In addition to its regular menu, The Fireplace has something called “humble offerings” from Sunday- Thursday. These are entrée options, always under $20, that fall into the “extreme comfort food” category – Chicken Pot Pie, Super Sloppy Joe, Bubble and Squeak, and Beef Stew have all been past choices. And really, that’s the best part about The Fireplace- even though it is located in a part of town with little to no competition in the “nice dinner out” category, has a lovely setting, and features a chef that clearly knows what he is doing, the air in the whole place is humble. The staff is pleasant and eager to help, the music is soft and understated, even the food is plated without a sniff of pretension – no garnish, no molding, just food. If you’re looking for a little Thanksgiving (and a lot of food) in the middle of the winter, The Fireplace is waiting for you. Twin lobster rolls you say!!! I hope you were very hungary! !